This fully revised 5th edition now includes 23 pages of free mapping. 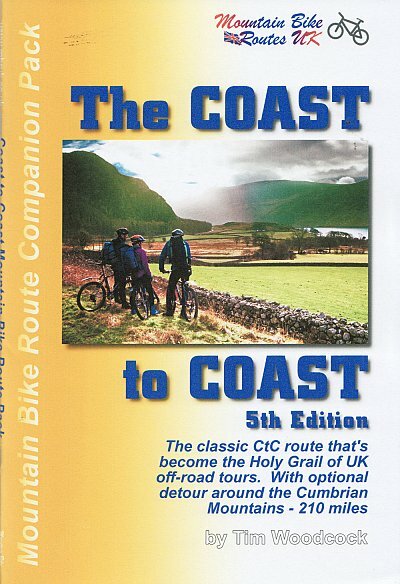 Sub-titled 'the classic CtC route that's become the Holy Grail of UK off-road tours. With optional detour around the Cumbrian Mountains - 210 miles'. 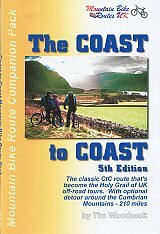 The Coast-to-Coast is the classic, long distance off-road ride in Britain and rated by many as the best. Inspired by the idea of Alfred Wainwrights 'A Coast to Coast Walk' the route passes through our three finest National Parks, crosses Englands great watershed and challenges our ingrained preconceptions of the inevitable 'North/South Divide'. From the wild and rocky fellsides of the Lakeland Mountains, born of volcanic action millions of years ago, over the bleak, peat moors of the Pennine Ridge, on through the delight of a limestone Dalescape, across the pancake pasture-land of Mowbray and finally to cross the wide open, heather-clad landscape of the Yorkshire Moors youll be filled with of a sense of freedom. Accommodation choice is excellent. Includes Ordnance Survey mapping, updated info plus an easy option via Keswick to avoid Cumbrias more severe passes and technical trails. Detatchable route cards and OS maps are bundled with the guidebook in a plastic sleeve.